Where to satisfy that summertime craving in Oakland and Berkeley. Gravy on fried chicken and waffles at Aunt Mary's. Summer, the ideal fried-chicken season. The days call out for a drumstick in one hand and a cold drink in the other. And hot sauces pair well with chill evenings. Plus leftover fried chicken as a midnight snack is bliss. Here are spots to visit when you want something fancier than Popeye's. Do you have anywhere from one to five friends who live within driving distance of Oakland and love fried chicken? Excellent: Have them meet you ASAP at Shakewell on a Tuesday night. For $49 (for two-to-four people) or $98 (four-to-six) you get a lot of food: a fried-chicken platter, bowl of stewed lentils, plate of sautéed kale, cornbread, and a variety of pickles and sauces to go along with all of the above. Crunchy, juicy, full of flavor. And don't sleep on the housemade roasted carrot and habanero hot sauce that comes with this dinner; it has all the well-rounded and fruity flavors of its ingredients, and compliments all elements of the dinner. For those who argue that the thigh is the superior piece of chicken, and that bone-in is always better than boneless, the chicken at Angeline's will challenge those beliefs. Angeline's boneless strips of breast are crispy on the outside, tender in the middle, and well-seasoned throughout. The tasso ham cream gravy is perfect for swiping bites of chicken, through, and for dipping the tender-crisp green beans in. If you do have strong preferences in your chicken pieces, Miss Ollie's has you covered. At lunchtime, you can order their fried chicken by the breast, thigh, drumstick, or wing. Their chicken skin is so good that you'll be relieved they do to-go orders, so you can appreciate the chicharrone-like skin in peace at home. During lunch, you can order a variety of sides, from creamy potato salad to fried plantains. Oh, and rice and peas that show off Miss Ollie's Caribbean roots, plus seasonal greens with smoked paprika and vinegar. Miss Ollie's also does both catering and take-out orders, if you'd rather eat fried chicken at your own table. For those of you who like your fried chicken with a waffle, at Aunt Mary's you get a boneless fried-chicken breast on top of a big waffle with both gravy and maple syrup ($2 extra for real maple syrup). These waffles are both yeasted and made from grits and flour, so they have more of a crunch to them than your standard Belgian. 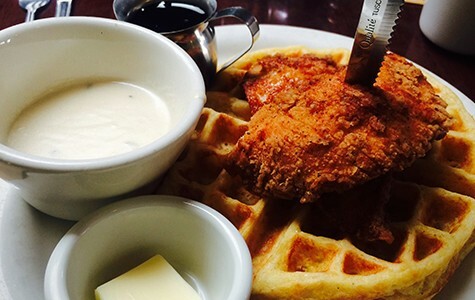 Their chicken and waffles are on their menu every day, for those of us who refuse to adhere to the idea that brunch is a weekend-only event. 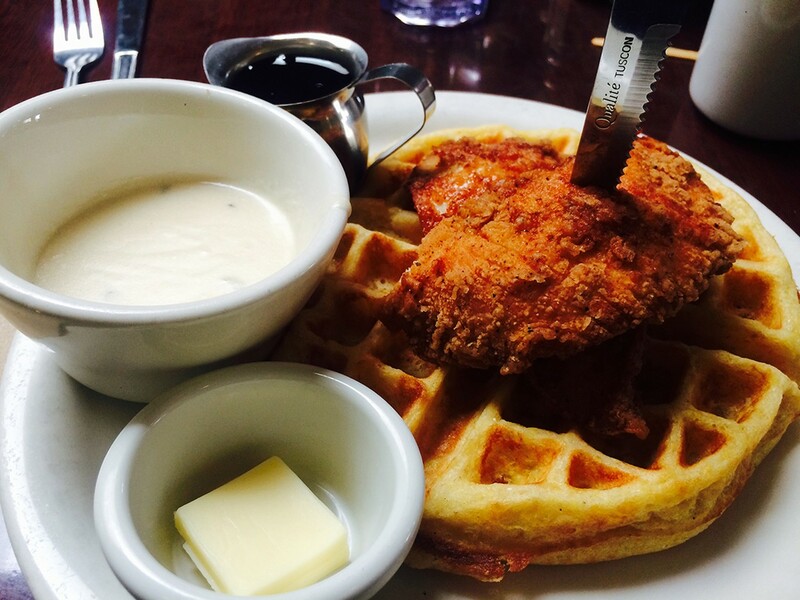 For a very different take, try the Korean fried chicken and kimchi waffles at The Half Orange. The boneless chicken breast is shatteringly crisp on the outside, the spicy and savory kimchi-cheddar waffle as weird and tasty as it sounds, and the chili glaze drizzled over both brings it all together. The restaurant's proximity to both BART and the Oakland airport make this the perfect spot to bring tired travelers after a long trip. If you're craving a more traditional version of Korean Fried Chicken, go to Ohgane. There, get the spicy KFC bone in, cut up into easy-to-hold pieces, and covered in a sticky sweet but spicy sauce that makes the chicken skin crackle like hard caramel. Warning: This chicken should only be eaten in the company of people who are cool with licking fingers, because the sauce is both delicious and addictive. Luckily, Ohgane does takeout, so pick up a few orders — along with some seafood pancakes, rice, and a bushel of banchan — for your next dinner party.